My name is Danielle. My students call me Miss Dani. I have been swimming as long as I can remember. I started with private lessons at the age of 5 and then went on to competitive swimming for 15 years. I have kept swimming in my life because I have grown to truly love the water and found it to be a great tool to maintain mental and physical health. Aside from enjoying swimming I enjoy my time at home with my dog Lola as well as spending time with friends and family. I decided to go into teaching to advocate how fun and safe swimming can be. My teaching style is the perfect combination of patience, encouragement and technical skills. Taking on a beginner swimmer is as much fun as it is challenging. It is very rewarding to take a beginner and help them become a confident swimmer who is eager and excited about learning new safe skills in the water. It is very important to me that these kids and even adults learn survival skills before anything, this way if ever a circumstance arises you know how to help yourself. I help motivate the student by being as encouraging and supportive as possible. I have taught children with special needs and found that patience is the best trait to have with them. Having the parent’s involvement is also helpful and encouraged. An open line of communication between parent and instructor is so important to manage goals and make sure I can exceed them. 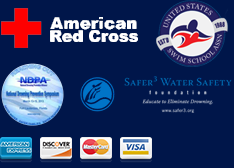 I have had my lifeguard certification since 2009. I started my lifeguard career working at Hurricane Harbor, Six Flags Great Adventure at the age of 16. The experience I had here taught me the importance of young kids learning the surviving skills we teach at Making Waves. While swimming competitively I was lucky enough to have some of the best coaches of Monmouth and Ocean County guide me to be the best I could be.